Welcome!!! It's Heartfelt Creations Inspiration Wednesday and today I have a quick and easy card to share with you. 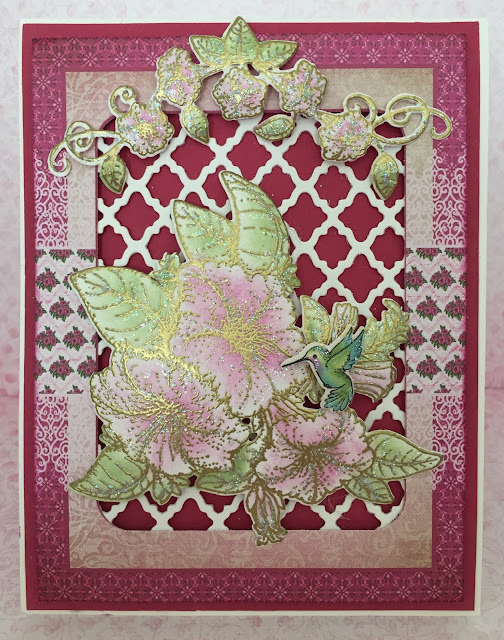 I just love how Heartfelt Creations makes it so easy to create a beautiful card in just a short amount of time and it still has that amazing WOW factor. I've used one of the beautiful card fronts from the Classic Petunia Collection paper pad, added the bouquets from the collection, a hummingbird, the Spellbinders Fancy Lattice, some glitter (we all need lots of glitter in our lives lol) and DONE! I hope you like it. Other products: VersaMark Ink, Spellbinders Fancy Lattice Die, White cardstock, Rose cardstock, dimensional tape, Sheer Shimmer Spritz Sparkle. Instructions: Create a white A2 tent fold card base. Add a rose mat 4” x 5 1/4”. Cut the card front from the Classic Petunia Paper Collection and ink the edges. Using the Cut Mat Create die cut out the center of the card front. Using white card stock, die cut the Fancy Lattice and adhere to the back of the card front with Dries Clear Glue. Adhere the card front to the base using dimensional tape. Stamp the Petunia Bouquets with VersaMark and heat emboss with gold embossing powder. Color using the Stack and Store Daubers and add glitter. Adhere to the card front using dimensionals. Cut small Hummingbird from the Botanic Orchid Paper pad, shape, spray with Shimmer Spritz, glitter and attach to Bouquet. Cut another panel from the designer paper, ink the edges and add to the inside of the card. This is gorgeous, love the embossing! You never fail to amaze me, love this gorgeous creation!!! Excellent and beautiful card this week! Beautiful Janet! I love the gold embossing!